WASHINGTON, DC--(Marketwired - June 16, 2015) - GovernmentContractingTips.com is widely regarded as one the best federal resources in government contracting. The website receives thousands of page views due to its massive library of contracting information and knowledge. The website is proud to announce the release of it’s Contractor Certification Quiz. This quiz gives the reader the opportunity to earn a free Certificate of Achievement. 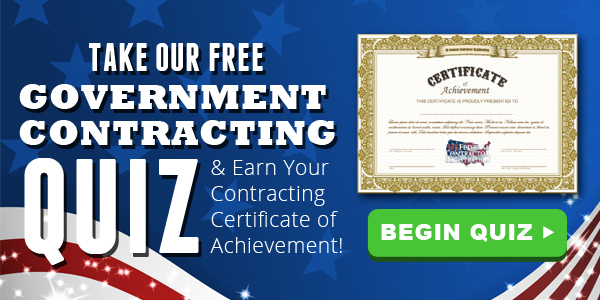 This certificate recognizes every contractor that passes this quiz as an expert in the field of government contracting. Businesses that do not participate in the Contractor Certification Quiz are missing out on a great opportunity to learn more about small business government contracting. The quiz covers 5 different lessons that discuss topics such as market research, GWAC programs, government registration, small business federal set-asides, FEMA contracts, government marketing, subcontracting, bidding on contracts and much more. Once all of the Contracting Lessons have been reviewed a reader can then attempt to earn the free Certificate of Achievement. Please review our Contracting Lessons prior to starting our quiz in order to be properly prepared for the questions. Click take quiz to become that much closer to earning your free Certificate of Achievement! GovernmentContractingTips.com covers numerous government contracting topics that are at the center of most discussions in the federal marketplace. Our website covers System for Award Management (SAM.gov registration), CCR/ORCA to SAM migration, Simplified Acquisition Contracts, FedBizOpps (FBO), Dynamic Small Business Search (DSBS), Federal Procurement Data System (FPDS), GSA Schedule information, Government Wide Acquisition Programs, Multiple Award Schedules, NAICS codes, BINCS, Basics of Bidding, Wide Area Workflow (WAWF), government invoicing, subcontracting, FEMA contracts, and Government Marketing Strategies. GovernmentContractingTips.com also provides information on Federal Set-Aside registrations for Service Disabled Veteran-Owned businesses (VetBiz registration), Economically Disadvantaged Woman-Owned/Woman-Owned businesses (WOSB registration), HUBZone businesses, and 8a Programs. This website was created with the sole purpose to educate and inspire small businesses to become involved in government contracting. Any business that would like to learn more about the SAM registration, find out if they qualify for any small business advantages, or learn more about any of the topics mentioned above can speak with a live Acquisition Specialist by calling the Contractor helpline at 877-252-2700 Ext. 1.